If you were born around the 80's, you might remember the iconic Pacman game. If not, you'll get to play it in this guide, after building it in Scratch from the ground up. You will also use the ShaKey to make a super special controller of your own. Complete this guide to get started with game programming! Here, you'll learn about programming concepts such as variables, and how to use conditional control blocks. The game will be programmed in Scratch, so go on and open up the Scratch editor. You could paint the backdrop, or choose a backdrop of the Pacman game. If you want to use another image, remember that the Scratch stage is 480px x 360px in size. Click on 'Convert to Vector' button. Delete the cat sprite by clicking on the little cross icon on 'Cat' as shown in the first image. Add a dot of colour in front of the Pacman for both costumes. Note: Choose a colour that is not the same as the background maze sprite. In the Sprite list, select the pacman sprite by clicking on it. Now for the code that will get the pacman to move, use the following blocks as shown in the image. Grab a 'when green flag clicked' block from 'Events' tab. Then set the second color option from 'color ... is touching ... ?' to the colour of the background. With the 'color ... is touching ... ' block, placed within the 'forever' block, the code is telling the pacman sprite this: Once green flag is clicked, start the game by moving forever, but only if the pacman is within bounds of the maze (black). Let's next program the pacman sprite to be able to change direction. 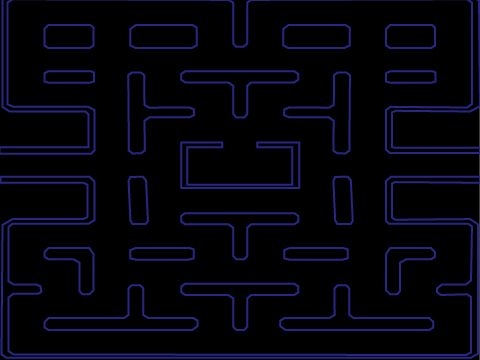 In Pacman, there are 'teleports' at either end of the maze map. Create another sprite, this time, using the rectangle tool to create a black rectangle. Now, let's make the Pacman teleport from that end where the first rectangle is, to the other end. Then add two 'go to x: ... y: ...' blocks. The pacman sprite moves to x: 150 y: 13 when it touches the left teleporter. Else, it will move to x: -148 y: 13 when it touches the right teleporter. Next, create the food sprite for the pacman. We've made a small orange circle sprite and named it 'food'. Click on the 'food' sprite you've just created. Then click on 'Code' tab. Finally, if the food sprite you created is too large, resize it so that it is smaller than the pacman sprite. Here, we have changed its size from '100' to '60'. The pacman game still needs some enemies. So create an 'enemy' sprite. To keep score, we'll need to create a variable. Check 'For all sprites' and then 'OK'. To score points, pacman just needs to stuff himself with food. So go on and add a 'set 'Score' to '0', and then add a 'change ... by 1' block. Arrange them as shown in the third image. Right-click on the 'food' sprite and duplicate another 9 more. Arrange the food sprites on the stage however you like. Click on the 'ghost' sprite before clicking on the 'Code' tab. What we want to do is get the ghost to stay in the middle box, and on start it will stay there for 3 seconds. Then it will glide in random directions and be able to pass through walls! You will need a 'glide ... secs to x: ... y: ...' block. Then get out a 'pick random ... to ... ' block. You'll need two of these, one for the x-coordinates and one for the y-coordinates. Change their range to '-240 to 240' and '-180 to 180' as shown. Finally, duplicate the ghost sprite for more of a challenge; We've made 9 more! To win the game, Pacman needs to eat all the food. To avoid losing, Pacman will need to avoid touching any ghosts. Arrange as shown in the image. The final step before we can use the ShaKey! We will need to add two more sprites for the 'win' or 'lose' situation. Here, we have used a rainbow sprite for 'Win' and a 'Oh no.. try again!' text for 'Lose'. Add these blocks for 'Win' and 'Lose' sprites shown in the third image. Now, the game is ready to be played on your regular keyboard. But here's a more fun and cooler way - you can use the 'shake' feature on the ShaKey! We'll make it so that when you shake the ShaKey, it will make Pacman move faster. Connect the ShaKey to your computer via microUSB. If you haven't done so yet, check out Set up Arduino IDE for ShaKey. Verify and upload the 'ShaKey-modified-for-pacman.ino' file to the ShaKey.